May is a special month at Olivet College and is exceptionally meaningful to the seniors. The Class of 2019 is celebrating its accomplishments with several events. Commencement is Saturday, May 18, but seniors start gearing up for the big day on Friday, May 17 with rehearsal, Baccalaureate and the Senior Celebration. Events kick off Friday, May 17 with rehearsal from 2 to 4 p.m. in Mott Auditorium, mandatory to all graduates participating in Commencement. Instructions regarding marching order, seating and program details will be covered at this event. Immediately following rehearsal, students may participate in Baccalaureate, a ceremony designed to be a blessing on the senior class. For graduates, lineup begins at 4 p.m. on the bottom floor of Mott Academic Center and will proceed into the Olivet Congregational Church at 4:30 p.m. Family and friends are welcome to sit in the pews. Baccalaureate includes musical performances by the college community and, each year, the senior class selects a faculty or staff member to serve as keynote speaker. This year, Blake Reed, Ph.D., assistant professor of chemistry, will be sharing remarks and memories. The evening concludes with the Senior Celebration in the Kirk Center at 5:30 p.m. Graduates and their families are invited to mingle with faculty and staff for refreshments. Dress is business casual. There are sure to be many photo opportunities during this last jubilee with these the senior class. The KC will remain open for dinner at normal cost to those not attending the Senior Celebration; however, the menu will be specialized to accommodate the party. Commencement is at the Cutler Event Center at 1 p.m. on Saturday, May 18. Lineup for seniors will begin at noon. A photographer will be on hand to capture special moments. Photographs will be available for order. There is no limit to how many guests can attend the ceremony. Free parking is available in numerous lots adjacent to the Cutler Athletic Complex, and the facility is handicapped-accessible. Both parking and admission is free for all events. 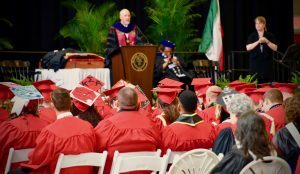 Learn more about Commencement and other graduation activities, including special seating requests, or contact Margaret Heppner, executive assistant to the provost, at 269.749.7618 or mheppner@olivetcollege.edu, with questions.